It wasn't easy starting this blog. 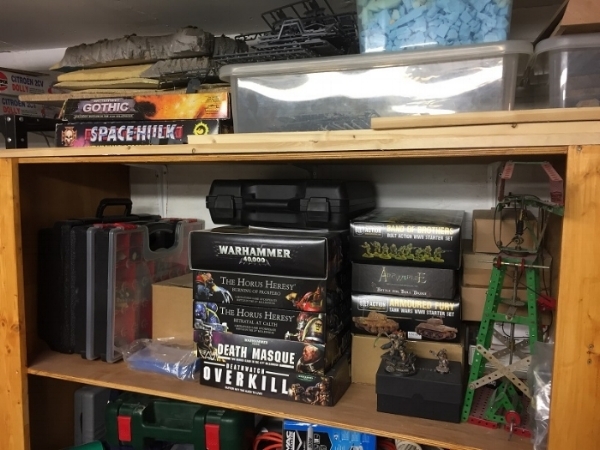 Bother Handro and I both have amassed sizeable collections over the last 5 years, and admitting that we (like everyone in the hobby (Brother Handro: "I keep saying, this IS the hobby!") have been guilty of buying the nice new shiny things, or even just buying older stuff with the view of "We'll get around to it one day". With this in mind, i have started the Wall of Shame! page. Herein shall ye find the reams of projects/models which lie disassembled, grey or otherwise incomplete. This list as stands today is by no means complete, and things will be added to each/all sections in due course. It doesn't include projects for which we have merely parts, It doesn't include terrain and It doesn't include the multitude of other little "bits and bobs" which we have bought/acquired through our time in the hobby. Perhaps a picture says it better? The above shows the boxes on my shelf, granted they aren't full, parts have been used. But it starts to show the scale of the problem. The next image shows the rack of things that need painting (and this is NOT the only source of models to work on! We have (in this frame anyway) 40K Dark Imperium Death Guard, in front of Blood and Plunder Bretheren of the coast, on top of a tray of Arcworlde (mixture of Battle for Troll Bridge, other assorted elves, and 12 sheep for some reason) - this list is just the top shelf. Other shelves have more Blood and Plunder, Tyranids, Bolt Action and one of a set of islands for Blood and Plunder. My hope is that, over the next few weeks and months, we will start to chew through our respective backlogs. Hopefully we will have more success, more pleasure and more gaming as a result!